What is the Easiest Language to Learn in the World? The short answer is, it depends on what languages you already speak. For the convenience of the people reading this post, we’re going to answer what is the easiest language to learn in the world for English speakers. Hopefully, we can all agree that there’s no such thing as being able to learn a language in one week or even one month. Especially if you want to sustain your knowledge over the long run. With that said, the easiest language to learn should be acquired faster than other languages, and with less effort. How similar is the language you’re learning to English (or a language you already speak)? Every language belongs to its own language family. 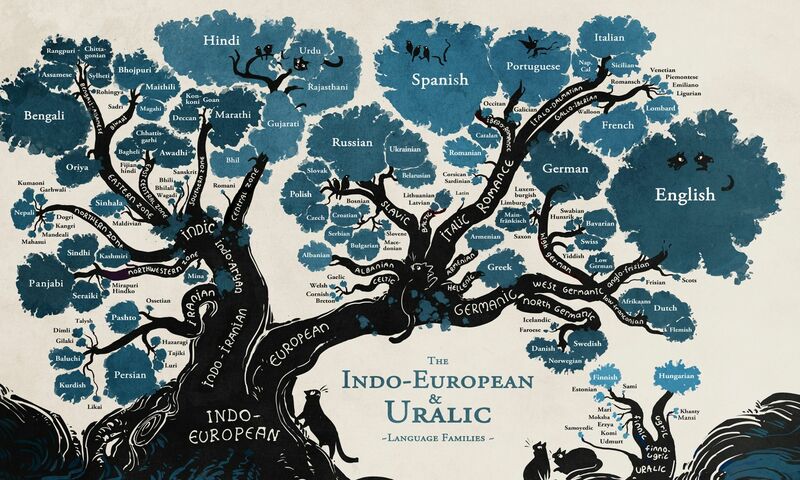 While all languages come from similar roots, they have branched into its own individual families as time passed by. For example, the Latin family has Spanish, French, Italian, and more. The Germanic family includes German, English, Dutch, and more. This means that languages in the same family share many similarities including vocabulary, grammar structure, accents, and more. It’s a lot easier to learn French once you already know how to speak Spanish than learn Mandarin. How many people do you have to practice with? The phrase ‘use it or lose it’ is one of the most important factors to keep in mind. No matter how much energy and resources you pour into learning Spanish, French, English, etc., you won’t go far unless you have people to practice with. This doesn’t mean you have to drop your friends and start making friends with people that speak your target language. Today, you can leverage language learning platforms like Rype, that enable you to connect with professional native speaking teachers. Nevertheless, if you’re trying to learn a language that’s not as popular, such as Albanian or Pashto, it’s going to be more challenging to find opportunities to practice. That’s why geographical location should also be a factor. If you live in the United States, particularly California, learning Spanish will be easier because over 30%+ of the U.S. population is Hispanic. Whereas learning how to speak French will be easier if you live in Quebec, Canada. How does learning the language benefit you? We’re all humans at the end of the day, with needs, aspirations, and finite time to strive for them. When we pour our time, money, and effort into something, we’re going to be more motivated when there’s a reward at the end. It’s what psychologists call the ‘Carrot and Stick’ method. The benefit could vary from person to person though. Person A may benefit from learning Korean because their family members already speak it. Whereas Person B may be learning French because their company is looking to promote a French speaker that can communicate with one of their high-profile clients. If you want to know the full list, check out our blog posts: The Scientific Benefits of learning a language, and 5 Most Useful Languages to Learn (to Make More Money). Now let’s get to answering what is the easiest language to learn for English speakers. To give you more options to work with, we’re going to offer the top 5 easiest languages from hardest (#5) to easiest (#1). French makes the list as the hardest of the easiest language to learn. While French is part of a similar language family, the pronunciation and grammar structure can be more complicated than other Latin languages for Anglophone speakers. Motivation can also play a role, as there are fewer French speakers who live in the western regions of the world. This means finding people to practice and interact with will be harder, and you may struggle to maintain motivation. Overall, French is not necessarily a difficult language to learn, and it’s one of the easiest languages to learn compared to other languages out there. If you’ve seen the infographic of the language families above, you saw that German and English come from the same family, Germanic. So why isn’t German the easiest language to learn for English speakers? First off, German and English do share many similar cognate words, making it fairly easy to learn. German also has rules regarding spelling that are more structured compared to other languages, and verbs in German tend to follow patterns. What’s particularly difficult for German learners is the reading and writing. It can be fairly complicated for beginners to get used to, especially if they’ve never learned Dutch or Swiss. However, speaking German should cause no problems, and it’s quite similar in English as long as you bypass the harsher accents. Italian is the most “romantic” of the romance languages. Luckily its latin-rooted vocabulary translates into many similar Italian/English cognates, such as foresta (forest), calendario (calendar), and ambizioso (ambitious). Many people have stated that certain grammar rules and words can throw one off, but the pronunciation of words usually sound as how they are spelled. No complications there. Overall, English and Italian share very similar grammar and speaking styles, making it simple for English speakers to pick up. There’s no real obstacle in learning this language quickly as long as you put in the time and work in. Portuguese is a language that’s very similar to Spanish. Keep in mind there are two distinctively different types of Portuguese that people refer to. One is spoken in Portugal, and the other is spoken in Brazil. You don’t have to worry about second-person: ‘Tu’ is rarely used in Brazil and most teachers won’t even cover it because of how rarely it is spoken. This alone should save you a lot of time when learning Portuguese. Making small talk is easy and patterns are recognizable: Once you’ve gotten the basics of Portuguese, being able to converse with a stranger is learnable within a few weeks. Despite Spanish being from a different language branch (Latin vs. Germanic), it shares tons of similarities to English. Not only that, with over 500M+ native Spanish speakers, there are tons of opportunities to use it wherever you go. The abundance of speakers also means businesses and corporations are looking for Spanish speakers to join their organization. It’s this unique combination of similarities to English, an abundance of speaking opportunities, and motivation to advance your career, that makes Spanish the easiest language to learn (and perhaps the most useful language). Experience the best way to learn a language.